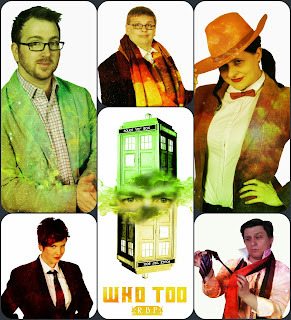 The promotion machine has begun for The Right Brain Project's summer production of "WHO TOO", the sequel to 2013's summer smash "The Timey Wimey Fantastic Brilliant Extravaganza (Geronimo)". Returning to the RBP stage for this show are Tom McGrath and Clint Worthington, and they will be joined by Charlesanne Rabensburg and Lauren Baker. Also returning to the fold to provide character voices are Jennifer Roehm and yours truly. Show dates are May 22 to June 21, Fridays at 8pm, Saturdays at 8pm and 10pm, and Sundays at 2pm, at the RBP Theater, 4001 N. Ravenswood (a block from the Irving Park Brown Line). For more information go to therpg.org/who-too. For ticket reservations, go to the Brown Paper Tickets website.